Next month the United Nations is gathering in Denmark to work on the Copenhagen Climate Treaty, ostensibly to reduce carbon dioxide emissions. Language within the Treaty itself should alarm any sentient being, especially Americans, as it calls for creation of a transnational government that would supersede our Constitution and subvert our sovereignty. That entity would have the power to directly intervene in the financial, economic, tax and environmental affairs of all nations that sign it. The fraudulent and ignominious premise upon which this threat to American sovereignty is being perpetrated is that of anthropogenic global warming (AGW). In unusual candor, the Club of Rome, a premiere global think tank, has revealed how such a “crisis” as AGW can be used to effect political change. They have said, “The common enemy of humanity is man. In searching for a new enemy to unite us, we came up with the idea that pollution, the threat of global warming, water shortages, famine and the like would fit the bill.” By claiming AGW as a crisis which is man-made and hence, reversible by changing consumption and energy production, they have concocted a scheme whereby national sovereignty is reduced, and a global governing body can dictate, tax, and meddle in national affairs on a global scale. The climate change mantra is touted as a means by which the global order based on the nation-state ought to be reconstructed based on political reasons, not environmental. The clarion call for “reduced carbon footprint” is merely the means to an end. And the end subverts our Constitution and our national identity. Intergovernmental Panel on Climate Control (IPCC), have falsified data, manufactured false “hockey-stick charts,” and created computer models projecting cataclysmic consequences for mankind if we don’t collectively revert to stone-age level subsistence. Evidence of this conspiracy was on full display last week when emails from the Hadley Climate Research Unit at the University of East Anglia, England were hacked and released globally. This is the unit that is responsible for ground temperature readings from which NASA’s satellites are calibrated. The emails prove that the temperature data was manipulated in order to show the results they wanted.They included documents written by Phil Jones, Michael Mann and other leading scientists who edit and control the content of IPCC reports. Even NASA’s James Hansen has been caught manipulating data and calculations used by AGW computer models. While this all reads like a conspiracy theory, the evidence is ample that the conspiracy is real. It is a conspiracy to erode national sovereignty and individual liberty and create and grant omnipotence to global governance. 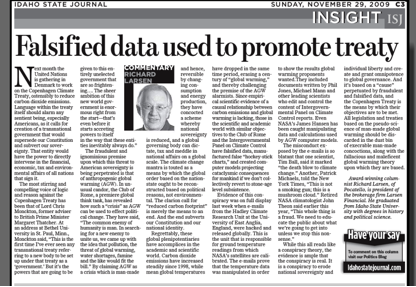 And it’s based on a “cause” perpetuated by fraudulent and falsified data, and the Copenhagen Treaty is the means by which their objectives are to be met. All legislation and treaties based on the pseudo-science of man-made global warming should be discarded in the dust bin of execrable man-made concoctions, along with the fallacious and maleficent global warming theory upon which they are based.